Jobs increased in financial activities, manufacturing and retail trade, among other areas. 159,000 jobs were gained from financial activities over the past 12 months, and financial activities overall added 63,000 jobs in the last 3 months with 33,000 of those jobs accounted for by insurance carriers and related activities. 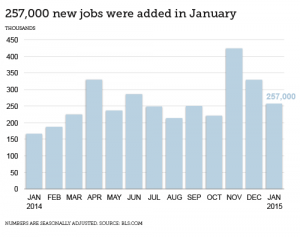 Additionally in January, professional and technical services added 33,000 jobs. These jobs included 8000 increases architectural and engineering services and 8000 more in computer systems design. The unemployment rate is currently at 5.7% and has show no net difference since its decrease in October 2014. The number of unemployed persons was relatively steady in January at 9.0 million individuals. The number of long-term unemployed – defined as individuals who are without a job for 27 weeks or more – remained the same at 2.8 million people, and constituted 31.5% of the total unemployed. Over the past 12 months, the number of people considered to be long-term unemployed decreased by 828,000. In January, employment in financial activities continues to trend upward with a gain of 26,000 from December. This came from an increase of 5,000 in investments and 14,000 in insurance carriers, securities, and commodity contracts that contributed to the total increase. The average workweek for employees on private, nonfarm payrolls remained steady in January at 34.6 hours. The manufacturing workweek increased by 0.1 hours and is now 41.0 hours. Factory overtime in now at 3.5 hours, with a decrease of 0.1 hours. The average workweek for production and non-supervisory employees on private nonfarm payrolls declined to 33.8 hours due to a decrease of 0.1 hours. The difference in total nonfarm payroll employment for November 2014 was revised from an increase of 353,000 to an increase of 423,000, and the gainfor December was revised from +252,000 to +329,000. Incorporating these revisions, employment increases in November and December 2014 were actually 147,000 higher than previously reported. These monthly revisions result from the annual benchmark process, monthly recalculation of seasonal factors, and additional reports from businesses since the last published data.